Wow! This quote hit me between the eyes. The longer my eyes look at it, the more it occurs to me that there are many kinds of clutter that can keep us from playing big. 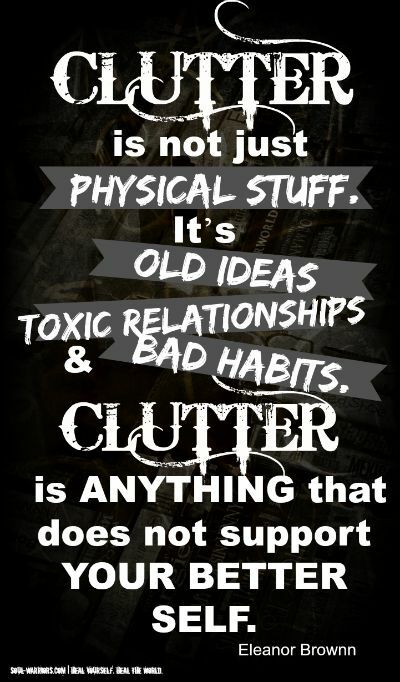 This kind of clutter is far beyond the items hiding in our closets, basements and attics. Often, they’re disguised as habits,memes, social expectations and so much more. Be assured, I want you to clean out your junk drawer. I guarantee you’ll feel better afterwards. What I am suggesting though is a more serious and beneficial cleansing of some of our daily lifestyle choices that take up our time and keep us from achieving our life purpose. When you are examining your habits, be brutal and honest with yourself even if it feels like it dishonors those you are ‘doing’ for. What is it that takes up your days so that you don’t have time to go after what you truly want? It could be running our children to perpetual activities; alcohol; shopping; television; house-cleaning; volunteering… This is saying ‘yes’ when we really want to say ‘no’. Sometimes they are masked as useful activities that are not just socially-acceptable –- they are socially-expected. I’m looking for some Feng Shui of the Soul here. Being on the same quest myself, I had thought I had done a good ‘Self-Cleaning’. What it did was expose another layer, creating an opportunity for more improvement (eye roll please). Just like any evolution, it just means you get to it and do the work. Maybe – just maybe – I keep some of this schedule-clutter in my life so I have an excuse to myself and the people in my world as to why I don’t accomplish my goals. Not that pursuing our life purpose should be hard work. Change is scary – only because is it different and unknown. You may do the introspection into Life Clutter and are not up for the clearing and this is fine. It’s a personal choice. However, there is no fooling yourself anymore about why you are stuck in a rut.